All transactions are safe and secure with a reliable history in online purchasing behind each of our associates. 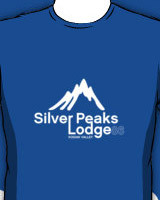 Buy the Silver Peaks Lodge t-shirt to own Hot Tub Time Machine clothing and merchandise. Who doesn't love the hot tub maintenance man, Chevy Chase? Pay homage to the actor and comedian with this Silver Peaks Lodge t-shirt. Without him realizing the Chernobly scrambled the hot tub, they may never have gotten back. It is available in a variety of colors and styles so you can pick your favorite. If this doesn't spark your interest, check out the rest of the Hot Tub Time Machine t-shirts including the Great White Buffalo t-shirt, Miami Vice tee or Winterfest '86 shirt. In addition to the Silver Peaks Lodge tee above, browse the Hot Tub Time Machine Clothing Gallery for more apparel like men's and women's clothes, kids shirts or hoodies.